am a day late on this but i wanted to let you in on our mini-lucky affair on wednesday. 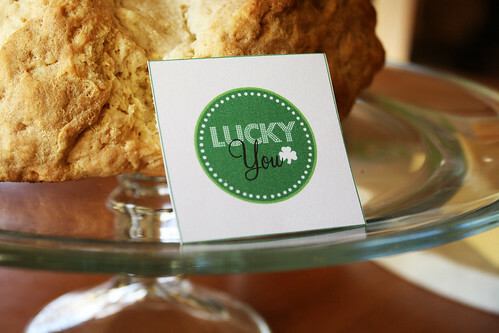 since i am gearing up to be mrs. sullivan come july, i feel i should have plenty of practice in being irish. that is why, in honor of st. patrick, we celebrated. i baked irish soda bread during the day... easy peasy for the fantastic results it produces. the dense, buttery loaf is a wonderful accompaniment to coffee or tea, stands up to extra butter and jam, or can be eaten right alongside your corned beef and cabbage. i brought out the new cheese board, on which we began our evening with irish cheddar (the most wonderful cheese+cracker cheese, in my eyes). matt arrived home with guinness (for himself), and baileys (a stand-in for the one who cannot yet withstand the bitter taste of guinness, ahem). i saved, printed and cut these cute little designs for the table and whipped up a shepherd's pie for dinner. amazingly, our new patio furniture was delivered earlier in the day and it was just warm enough to eat outside. 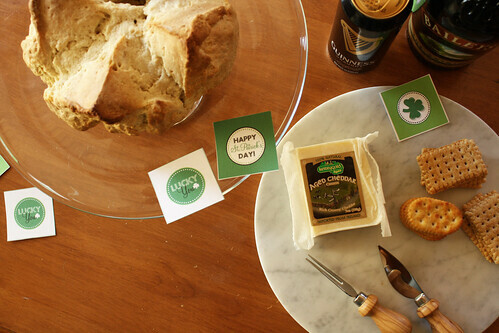 our little feast was delightful, and i am excited to continue my work with irish recipes. have a wonderful weekend- we are approaching 70 degree temperatures here- and get ready to welcome spring! be sure to stop back on monday for my first ever giveaway!